Q1. Is GST a regressive tax, that is the poor will be taxed more heavily than the rich? Answer: By itself, it would be. However in Malaysia's implementation there are thousands of items that have been exempted while BR1M was introduced and increased. On top of this, our personal income tax was reduced and restructured which means households earning RM4,000 per month no longer needs to pay any tax. Take the example of a household earning RM3,000 per month which now no longer pays any income tax - unlike in the Mahathir era. This household would have the usual monthly payments such as for rent, insurance, utilities, petrol, public transpiration, loan repayments or savings. All of these are exempted from GST. Another RM1,000 would also be spent per month for fresh food such as rice, meat, fish, vegetables, fruits. Again, all of these are exempted from GST. So, it is possible that this household spends RM1,000 per month on goods and services that are GST-taxable. RM1,000 X 6% = RM60 per month in GST or RM720 per year. However, this household is eligible for BR1M of RM1,200 per year. Thus this household actually gets back RM480 per year (RM1,200 minus RM720).benefit - which means they are being NEGATIVELY taxed. In fact, the net benefit is even more as under the previous sales and service tax (SST) system, this household would probably have paid for these taxes without realizing it. For example, cars and spare parts have reduced in price under GST compared to SST while imported fruits such as apples or oranges had a 10% sales tax which is now abolished and became exempted from GST. So, the lower income household is actually a net beneficiary of the GST system. Rich people would be spending a lot more on higher value purchases, eating out, entertainment etc.. they will surely be paying a lot more in GST every month compared to the lower-income families. Therefore the Malaysian GST system is NOT a regressive system that oppresses the lower-income families. It is a progressive system where the lower-income families have become a net beneficiary and is helping to improve our income equality. Q2. Which of the estimated 174 countries in the world have abolished GST after implementing it? Q3. Is the GST an additional tax that burdens the rakyat? Answer: In the Malaysian context and unlike some other countries implementing GST such as UAE or Saudi Arabia, the implementation of our GST cannot be considered as an additional tax. In preparation for GST and on the day of implementation, corporate taxes were reduced from 28% to 24% while personal income taxes were also restructured and reduced from 28% to 24%. As a result, many middle income people now pay a lot less personal income taxes while the lower income groups no longer needs to pay any personal income tax. 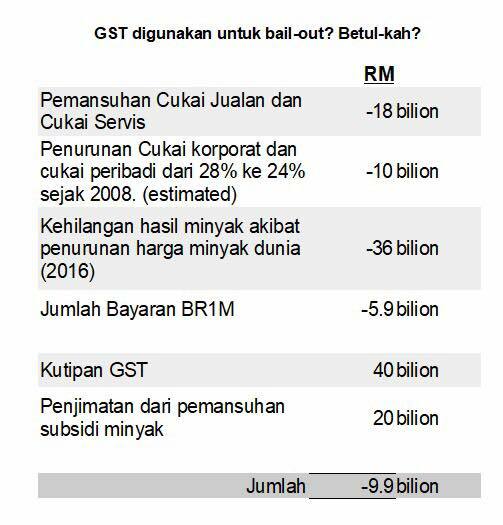 On top of that, Sales Tax of up to 20% and Service tax of 6% were also abolished while BR1M was introduced and increased. Therefore, the GST in Malaysia CANNOT be considered an additional tax but is a reformation of our taxation system. Many people only see GST now but forgot about the reductions and abolishment of other taxes as well as increased benefit payments that came with GST. Q4. I have heard that GST is "Haram" under Islam? Answer: While I am not qualified to answer this on a religious basis, but the fact is that many countries that consider itself as Islamic countries have implemented GST. Other than Iran which introduced GST in 2008, Saudi Arabia and the UAE have now implemented it starting in 2018 while countries such as Oman, Kuwait and Bahrain will implement their GST next year. Q5. Does the GST contribute to inflation? Answer: Yes and no. Depending on the context you mean. When GST was introduced, prices for some goods increased while others such as cars, spare parts and certain white goods reduced due to GST replacing the higher sales tax of 10%. Any changes in tax will contribute to inflation but this is a ONE TIME effect. GST, like any changes in tax cannot by itself contribute to a sustained increase in inflation or change the inflation rate after the initial period of its introduction. It is now coming up to 3 years since GST was implemented and it is simply no longer possible for GST to continue influencing inflation rate since the GST rate did not increase since it was implemented. If you believe this is possible then you will have to believe that sales or service tax that was introduced in Malaysia decades ago would have been contributing to inflation for decades. It is simply not possible. As explained above, a change in taxes will produce a one time increase in inflation. 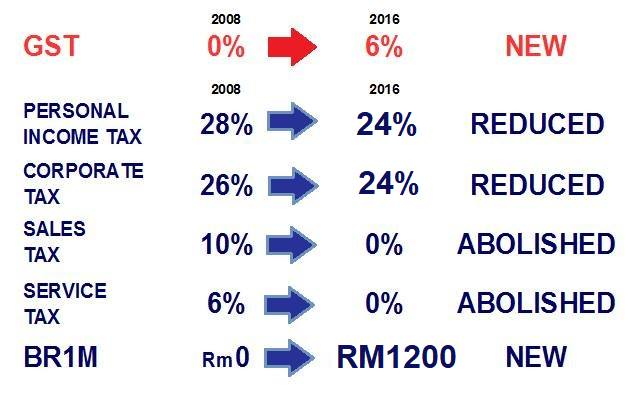 In Pakatan's case, they intend to keep GST but reduce it to 0% and bring back Sales Tax, Service Tax while introducing inheritance tax as well as Capital Gains Tax. These new changes in tax proposed by Pakatan will produce another round of inflation as traders will use this as an excuse to raise prices again by claiming they have to bear new taxes will still having to pay for the administrative cost of maintaining the GST system. Q6. If corporate taxes and personal income taxes have been reduced while sales tax and service tax have been abolished, why is the govt collecting more money than before? Where does this extra money come from? Answer: Honest tax-paying citizens and companies will enjoy the reduction. However, those who have never reported or under-reported income or corporate taxes before, those running illegal businesses (or the so-called black economy) such as loan-sharks, prostitution, illegal gambling, tourists and foreign workers who do not pay any income taxes will no longer be able to escape the GST. The additional collection comes from these groups. Q7. 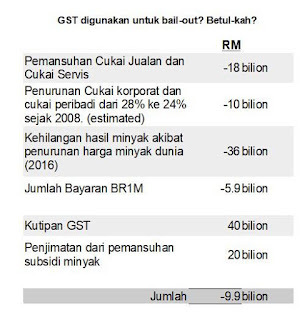 Is the govt is using GST money to bail-out 1MDB/Govt/mismanagement/corruption etc ? Answer: If the purpose is simply to get additional revenue from govt to bail out this and that, the simplest thing for govt to do is to stop reducing all those corporate and income tax and simply increase existing taxes such as sales or service tax. Why the need to implement a "new" visible tax like GST and invite political attacks? Anyway, as answered in Q3. GST cannot be considered as an additional tax that is meant to burden the rakyat but seen as a wide-ranging tax and benefits transformation to increase our country's competitiveness, reduce leakages in blanket subsidies, reduce our country's reliance on petroleum, reduce tax evasion, reduce income inequality as well as ensure that aid reaches only to those who need it and not to the rich. 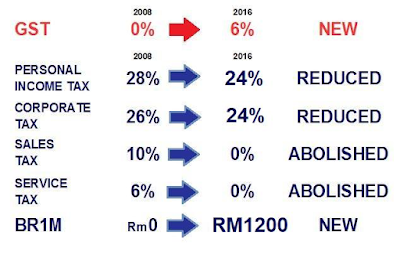 Many people only see GST but forgot about the reductions of taxes, abolishment taxes, reduction in petroleum revenue as well as increased BR1M benefit payments that came with GST. As you see from that table and taking into account the losses from the huge 80% drop in global oil prices in recent years, the net effect of all these changes and payments is almost neutral or negative for the govt. Which makes it strange that Pakatan politicians keeps mentioning about the RM40 billion collection in GST but does not talk about the RM40 billion loss in petroleum revenues, the RM10 billion loss from corporate and personal income tax reductions, the RM18 billion loss in sales and service tax nor the RM7 billion paid in BR1M. Despite continued positive GDP growth, these changes are why total yearly Federal Govt revenues for the years 2015, 2016 and 2017 are in the RM220 billion to RM230 billion range - almost comparable to the RM220 billion revenues that the govt collected in the year 2014 when GST has not been implemented yet. Since the total revenues remains about the same, the question of GST being additional money to be used to bail-out anything does not arise at all. If there was really a need to "bail-out" anything then the government could have used Petronas money - just like how Tun Mahathir kept using Petronas money to bail this or that out. This would be the easiest thing for PM Najib to do but he does not do so. 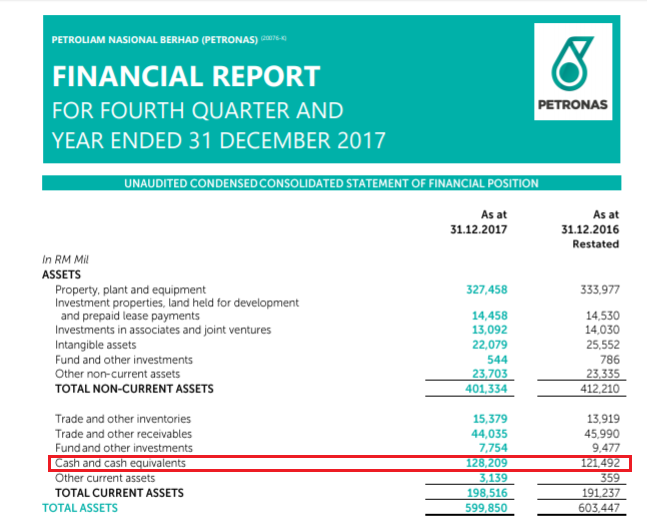 As at end 2017, Petronas' cash balance has jumped to RM128.2 billion. 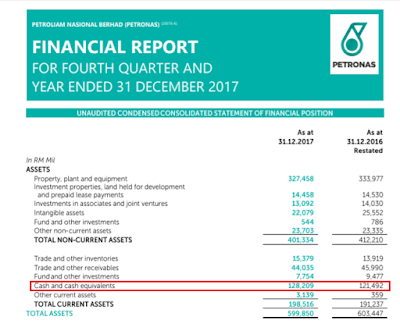 Unlike Tun Mahathir, PM Najib prefers to let Petronas keep most of its cash so that it can expand its business in its own field to be a world class petroleum giant. Q8. The government is not transparent in showing how GST money is being spent. Answer: GST revenue is treated the same as any other collections from the govt including corporate tax, income tax, duties, petroleum revenues, dividends received - meaning they are put into the government consolidated funds. GST revenue is not treated separately nor spent separately. How the government then spends these consolidated funds (which includes GST revenue) is detailed every year in our budget and then audited by the Auditor-General.